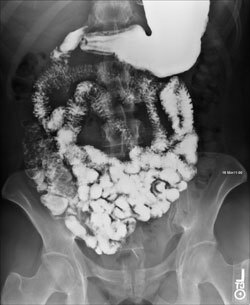 Several radiologic procedures fall into this category including upper GI studies, barium enemas, cystograms, and arthrograms. These procedures require the administration of a contrast agent by injection, mouth, or enema. This contrast will enhance x-ray images, making diagnosis easier and more accurate. During these procedures, images are taken before and after the contrast is administered. The radiologist will watch the progress of the contrast agent, assessing and diagnosing any abnormalities. There is usually a preparation for these exams which should be explained by your physician.